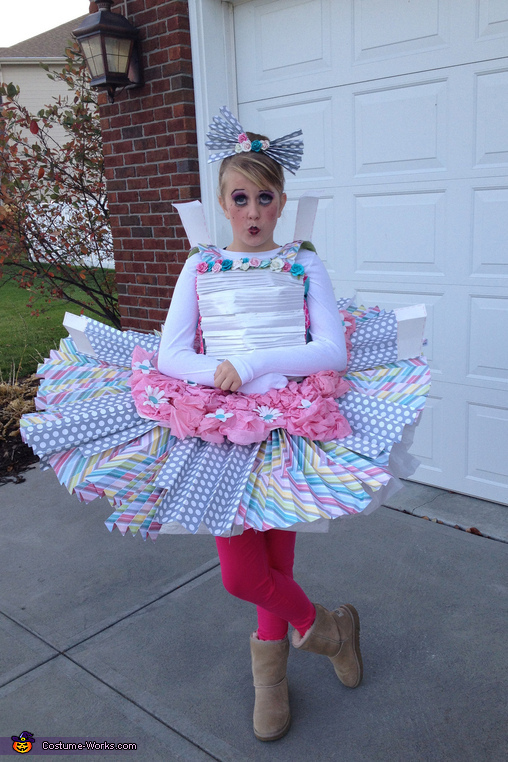 This homemade costume for girls entered our 2012 Halloween Costume Contest. My daughter wanted to be a paper doll for Halloween. We searched for ideas, and most of the ideas out there were flat one dimensional pieces of paper hanging over your body. Cute, but as per usual, we wanted bigger and better. :) In our search, we also came across many paper dress concepts, and Project Runway had done a challenge as well of making fashion out of paper. This inspired this costume. We decided the best paper doll, would be a doll wearing a dress made of paper. I started with the bodice of the costume. I made a duct tape dress form, by wrapping my daughter in duct tape around her torso. I wrapped almost an entire roll of duct tape around her to make sure it was sturdy enough to hold up. Then we cut the duct tape form off of her, and covered the top in paper. I did small piece of paper on the straps, in a mosiac pattern, and then did larger piece for the sides. The middle section of the bodice is vellum paper that is fan folded to look like pleats. THe paper was all glue gunned to the duct tape form. We then embellished with paper flowers, and tape. The skirt was a bit more of a challenge. I started by using an embroidery hoop and attached fan folded paper to the hoop. I layered and glued 20 plus pieces around the hoop until it was full and complete. I then took a piece of poster board, and cut out a wavy piece to go around her waist to look like another layer of fabric. On top of this layer, I added tissue paper flowers in pink, and topped them off with white paper flowers. This added a ruffle around her waist area. The problem we ran into was getting the hoop to stay around her waist. it was a little too big, and the hoop, coupled with all the paper made it very heavy. Finally we decided to use a foam chair cushion that we purchased at Joanne's as a base for the hoop to sit on around her waist. We cut a hole in the center of the foam cushion, and she was able to pull it up around her waist. It was snug, but the foam definately stretched enough to get it around her and yet be a perfect place to secure the hoop. We added fan folded tissue paper to the foam cushion to create a petticoat look to complete the dress. Once done, we laced the back of the top together, and she was secure. We added paper "tabs" to mimic the paper doll tabs. Her bow is a simple fan folded paper, with paper flowers attached. Her makeup is just a combination of doll makeup ideas that I found on pinterest. THis was a super fun costume, and it took me one day to complete. Very easy, but very big impact! The only downfall was getting her in and out of the car..lol. That was a bit challenging, but we made it work! So unique!!! :) I vote for you!! Such a fabulous idea and costume! Love the details and the PLEATS!!! Oh my! LOL! Very nicely done!! You have my vote!! So cool! I don't think I've ever seen paper used in this way. I really am intrigued. Here's my vote!